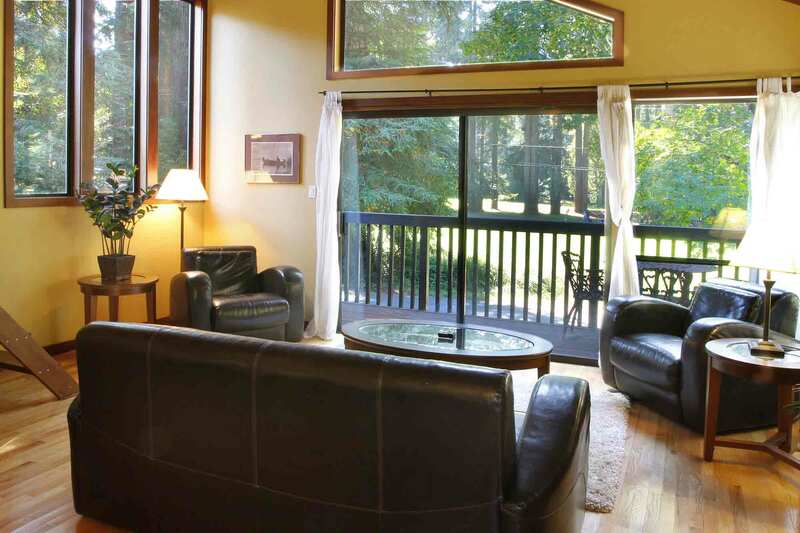 Spacious, Light Contemporary Riverfront Home, River Views, Redwoods, Woodstove, Outdoor Dining, Hot Tub, Lawn, Seasonal River Access & Boats; Walk to Dining, Northwood Golf; Short Drive to Downtown Monte Rio, Guerneville, Wine Tasting, Hiking. Wi-Fi, Landline Phone, Cable TV. Keyless Entry. One Well-Behaved Dog is Welcome! The entry to this home is up a flight of steps one level. 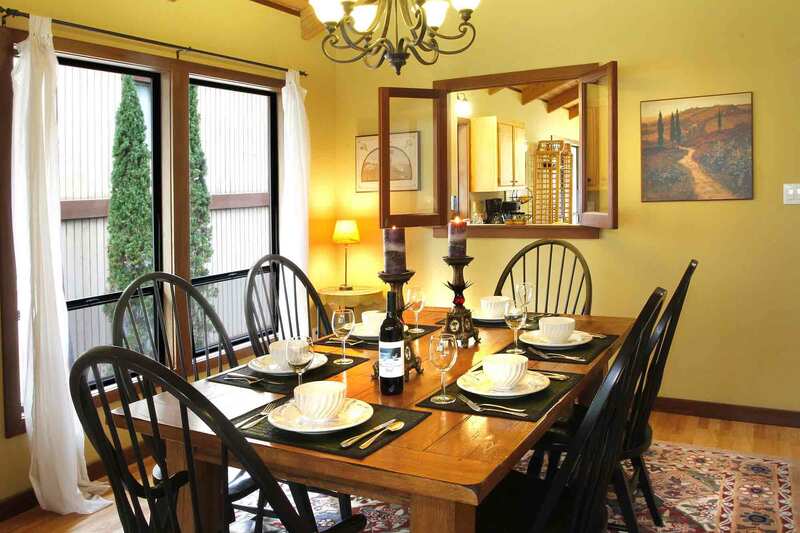 The living/dining room is at the front of the house, with a semi-formal dining area and a small deck overlooking the second fairway of the golf course. Down the hall from the living room, at the rear of the house, the family room opens to a deck with outdoor dining. 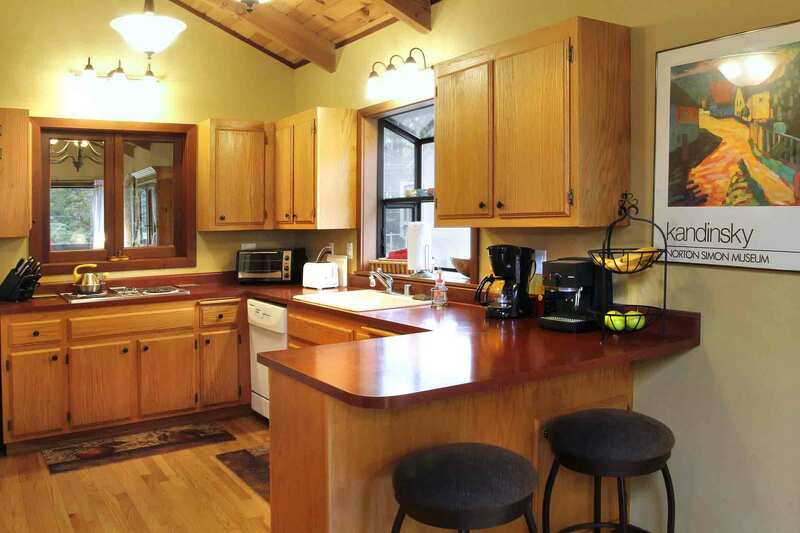 In the family room, there's a breakfast table, and the kitchen is adjacent. There's a master bedroom with its own deck and adjoining full bathroom, a second bedroom and full hall bathroom. 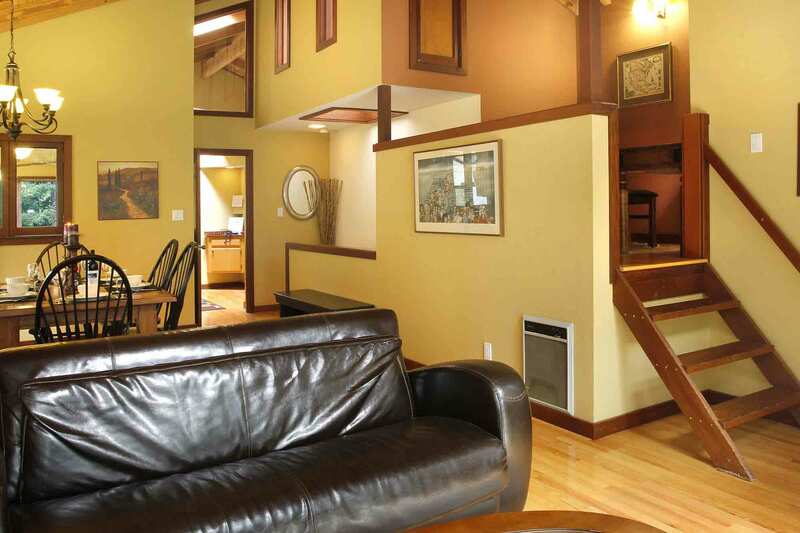 From the living/dining room, stairs lead to a loft with desk set. From the rear yard, there's a short downhill path to seasonal river access. 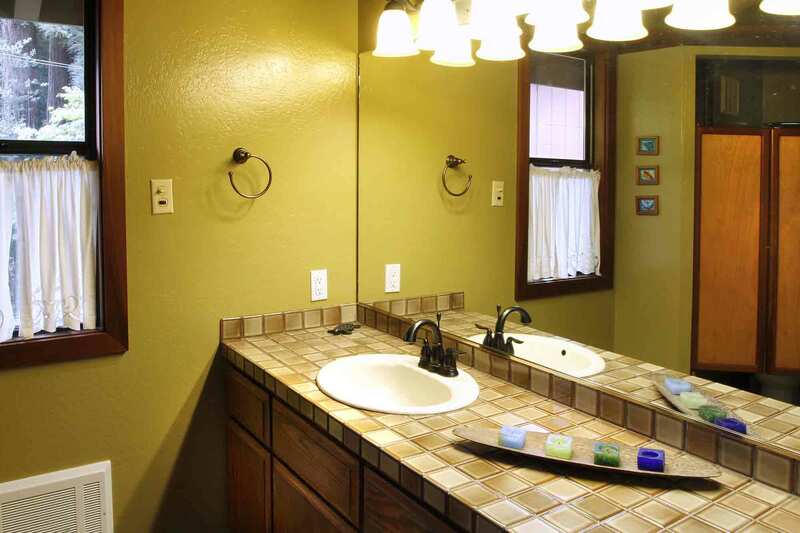 This home is approximately 1900sf. Note home has outdoor security cameras directed at the driveway/entry. 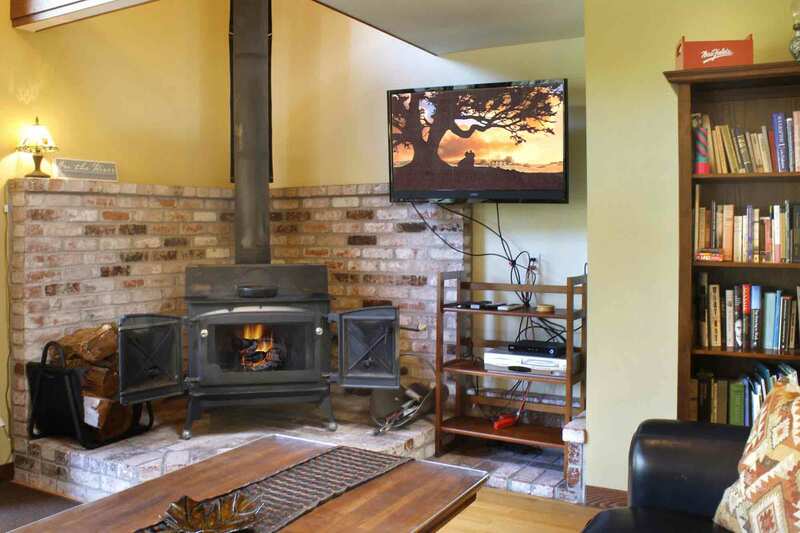 Wall/Baseboard Heat, Woodstove (family room). NO A/C. Walk to Northwood Golf complex dining, coffee, and of course, golf! This roomy 2b/2b was perfect! 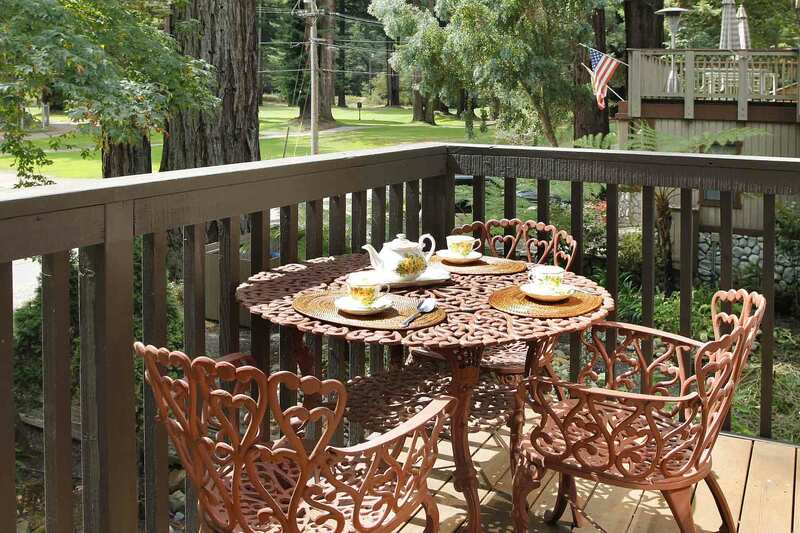 It is across the street from a beautiful 9 hole golf course amongst the redwoods. 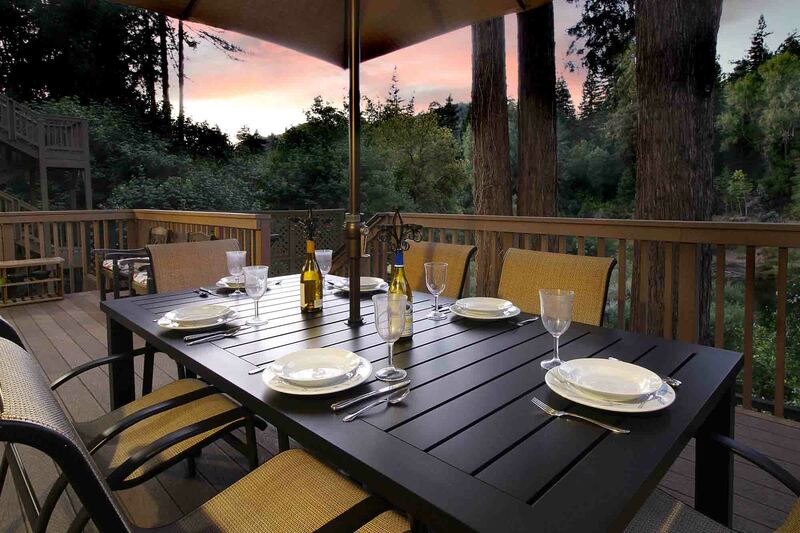 The back patio overlooks the Russian river. Tons of space for indoor and outdoor dining. The kitchen is fully equipped. When we come back to this area I would love to stay here again. Next time it will be for much longer!! Highly recommend for couples or families with kids. This was a great house that I would rent again. 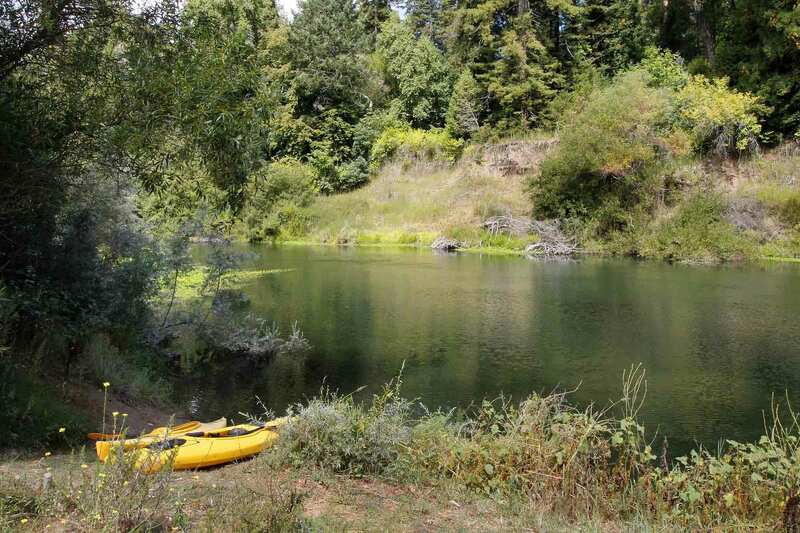 It's right on the river, quiet, and super close to Guerneville, Jenner, and loads of amazing wineries. 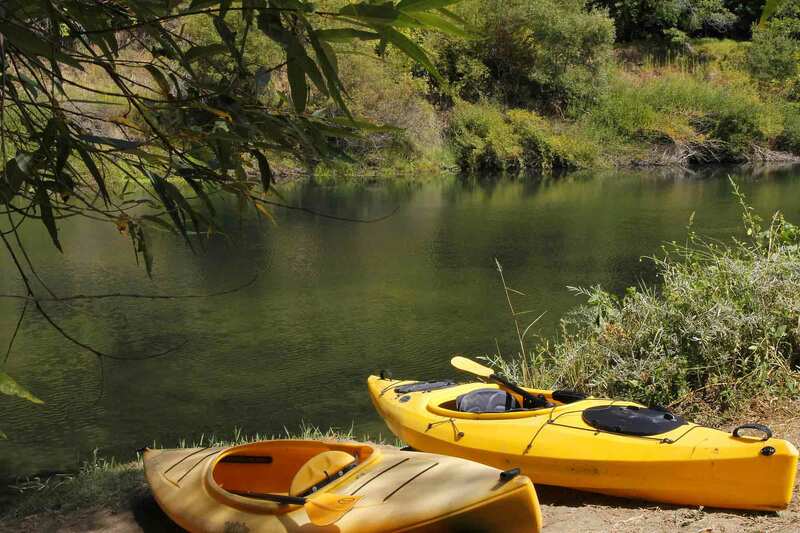 "Exceptional place and dog friendly location"
"Had a great time at this riverside retreat! " Had a great time at this riverside retreat! 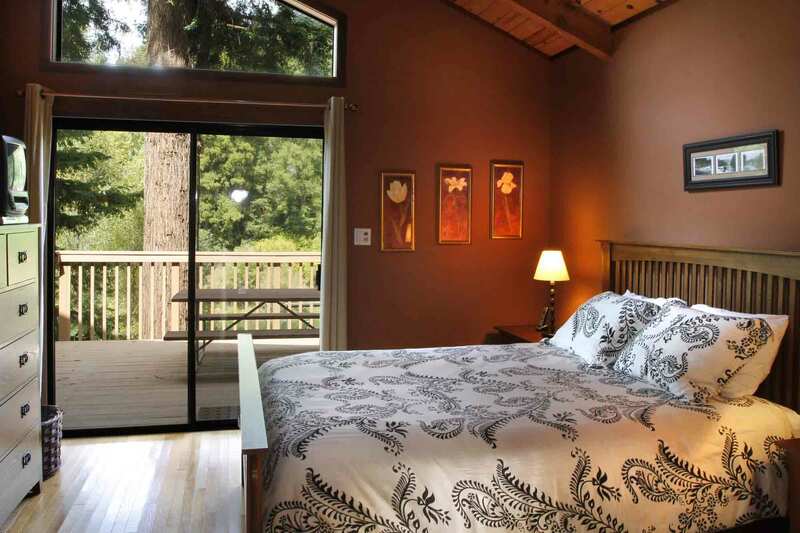 Surrounded by redwoods and next to a golf course, it made us feel a great sense of calm. Hanging out in the hot tub at the end of the day was a nice bonus as well! "Great Overall..but needs a Kitchen Update and some TLC"
The whole team was incredibly helpful and this was a really unique house. We had a wonderful weekend there. I'd highly recommend this home to anyone. Wild flour bakery is definitely worth the drive and Jenner is a beautiful little town. The road bike riding nearby is also great. "Great location on the river with plenty of room for everyone." The house was very comfortable. Only two minor issues. We were a little disappointed with the condition of the kayaks (5 kayaks but only 4 paddles). Access to the river was a little difficult. Someone was clearing some trees and there was downed branches on the way to the launch area but they were cleared on the second day. The river was very low, probably the time of year, but we had a good time going up and down river. We also played a round of golf. The second fairway of this beautiful course is right across the street. Shopped for antiques and took a short drive to the coast and the headwaters. Overall we had a great little vacation over the 4 days. We'll be back! This is a very clean and spacious home, overlooking the second fairway of the historic and picturesque Northwood Golf Club, a regulation nine hole gem of a course, with fairways lined with towering redwoods. 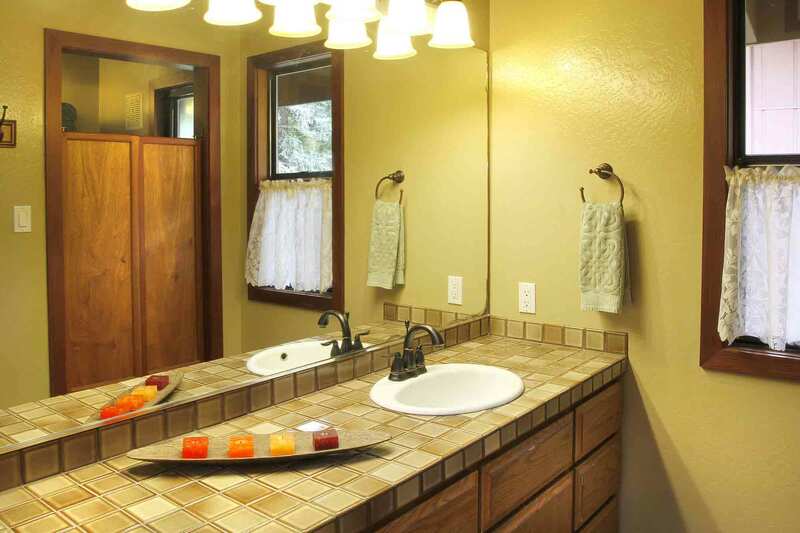 The house is roomy, with good natural light, and with nice outdoor decks facing both the golf course, in front, and the Russian River, in the rear. Like Monte Rio, the house is comfortable and homey, but not especially deluxe. The kitchen is adequately equipped, and there is a Weber kettle BBQ on the rear deck. We didn't use the hot tub, but it appeared to be roomy and functioning well. Access to the river is possible, but the trail is steep, not recommended for those with physical challenges. We would definitely rent this house again. "Wonderful getaway for the whole family!" Russian River Getaways delivered consistently excellent service to me and my entire family from the day that we started to think about this rental until we collected the last item we had left behind. 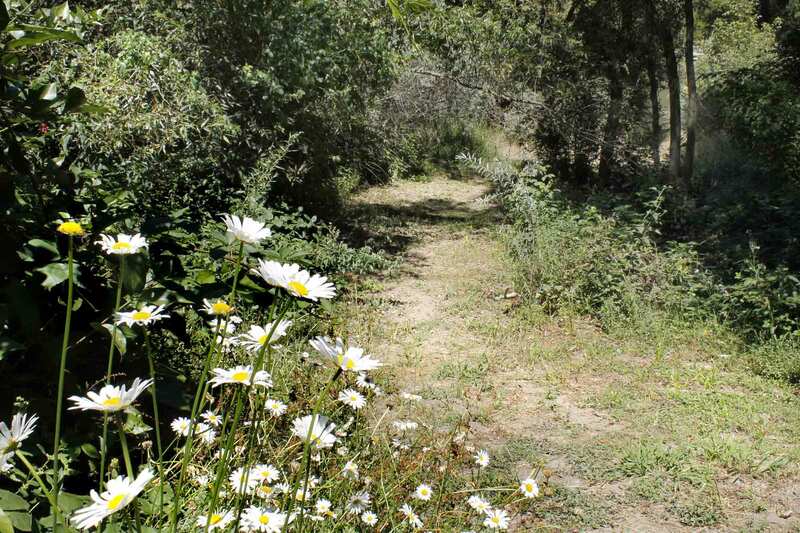 The house was immaculate and fully equipped and the river is a wonderful natural environment. The best feature was the kayak navy that comes with the house, ready for use. "Fantastic Home, Great Location, Plenty of Kayaks!" This place worked out great for our family. We had 8 people. The house is in a great location with River Views from the back and the Golf course from the front. It is a beautiful home and very clean with plenty of space for all of us. We really liked the fact that they had plenty of Kayaks, 6 or 7 if I remember correctly. The hot tub was spacious and very nice. The only downside was you had to drag the Kayaks down to the river and back up a small hill to get them back to the house. It's only about a 100 yards so not that big of a deal. I would rather do this than rent a place with a dock with fewer Kayaks though. This house was everything we were hoping for. The jacuzzi worked just fine (could have been a little bit hotter, but it was ok). The beds were comfortable (at least the one I slept in). The kitchen and dining room were just right. Great location too. "This house made for an amazing getaway..."
We started off with a rough first night at Tuck It Inn in Cazadero (don't stay there - the house is more funky than charming.) We called Russian River Getaways first thing the next morning to see if we could switch houses - mainly because my mom couldn't navigate the steep dirt trail down to Tuck It Inn, and all the stairs once you got inside. 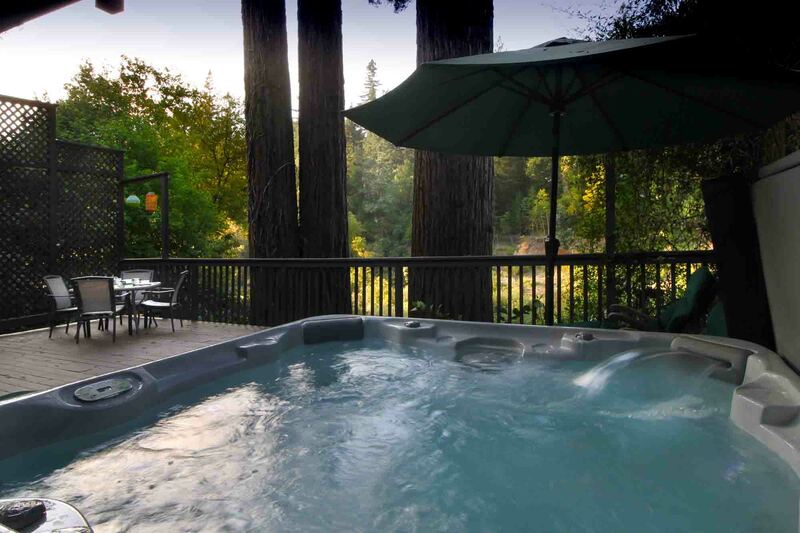 I was expecting to hear that we were stuck with the house we booked, but Russian River Getaways was fantastic. They gave us a list of available homes and we selected one, having to pay the increase in rate and the cleaning fee for the new home. 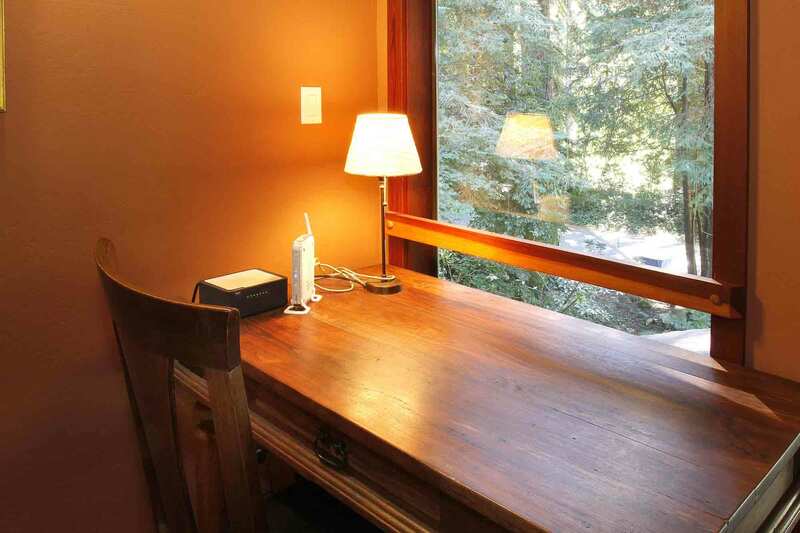 We picked the Northwood Beach House and loved it; it completely turned our vacation around. 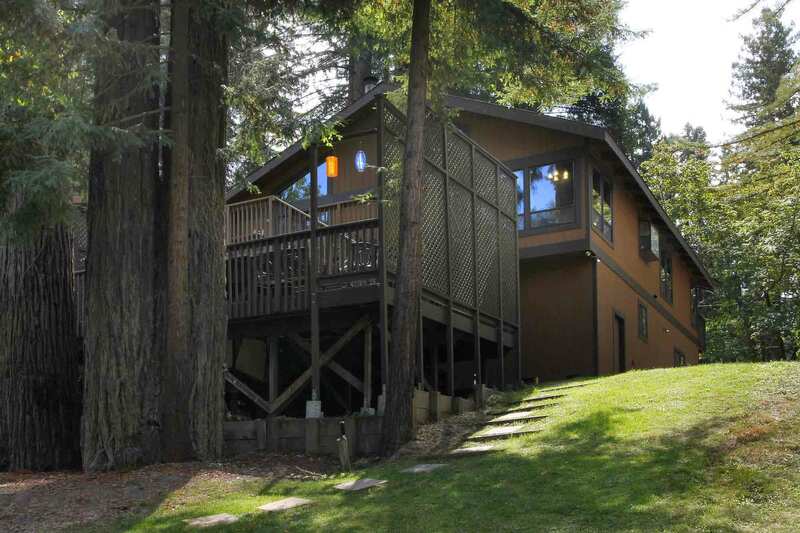 The house is on the Northwood golf course, which is a beautiful area studded with redwoods. The front of the house overlooks the golf course, and the back of the house overlooks the river. The house is spacious - at 2,500+ sq. 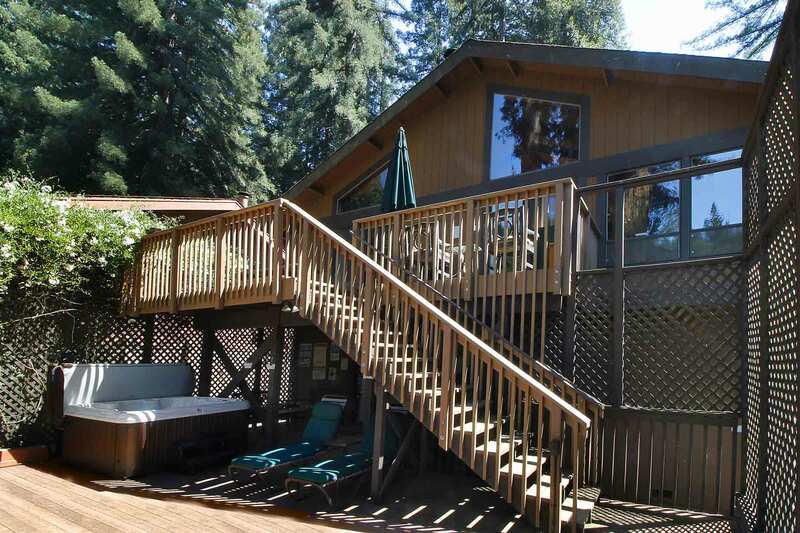 ft. - with tall ceilings, big windows, big decks, a huge hot tub, and wood floors throughout. Having our own beach access was perfect for our two dogs, and we took the kayaks out daily - we loved not having to drive anywhere and rent kayaks to get on the river. And while we had made several dinner reservations, we ended up cooking every meal at the house because we just enjoyed hanging out there.The one room for improvement is that some of the furniture could use an update. The family room and breakfast nook furniture looks to be circa 1990, and the mattresses in the two upstairs bedrooms could stand to be more comfortable. But between kayaking on the river, running around the golf course, and jumping in the hot tub at night, this house made for a fantastic weekend, and we'd stay there again in a heartbeat. "A very relaxing and pleasant retreat." More accessible entry to the river. Boats were great! The house was beautiful. We had plenty of room for our family. The views were amazing. We had so much fun Kayaking on the river and felt very safe with the provided lifejackets! Overall a great, relaxing vacation! "Great place. Bad access to the river. Should have tv, everybr"
Look, this place was a wonderful place to stay with your family. Lots of space for everyone. But, you should have a tv in every bedroom with cable. The access to the river is misleading. Not good for small children. Needs more beach area. No room to lay out. Could be dangerous for small children. A group of girlfriends stayed here for a weekend away. We all enjoyed Northwood Beach House. The neighborhood is peaceful. There are amenities (Safeway, for example) very close and a few of us went for morning jogs along the golf course across the way. The hot tub was nice to have one evening. We took the provided kayaks and canoe and inner tubes out on the river; it was lovely. Overall, if you're looking for some relaxing and peaceful downtime, this is a great location. "All together under one roof, but not underfoot!" 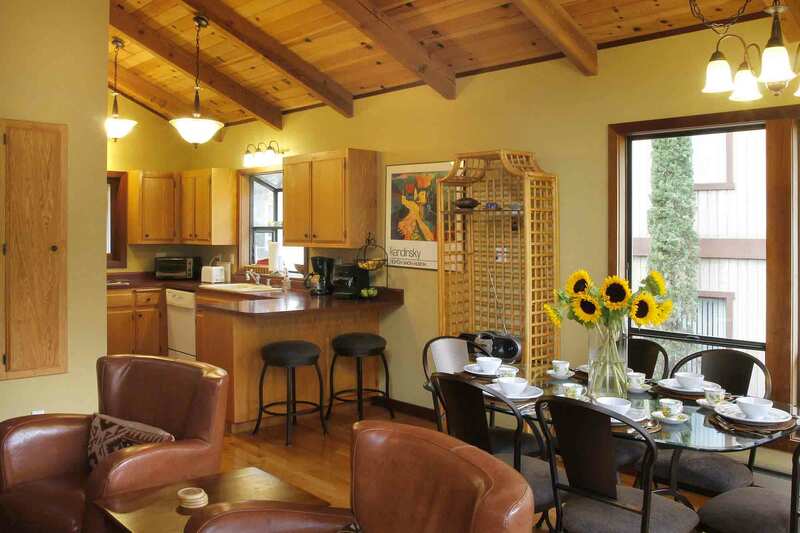 "Big house, but not without peculiarities"
Northwood Beach House is one of many houses we've rented in the Russian River area. 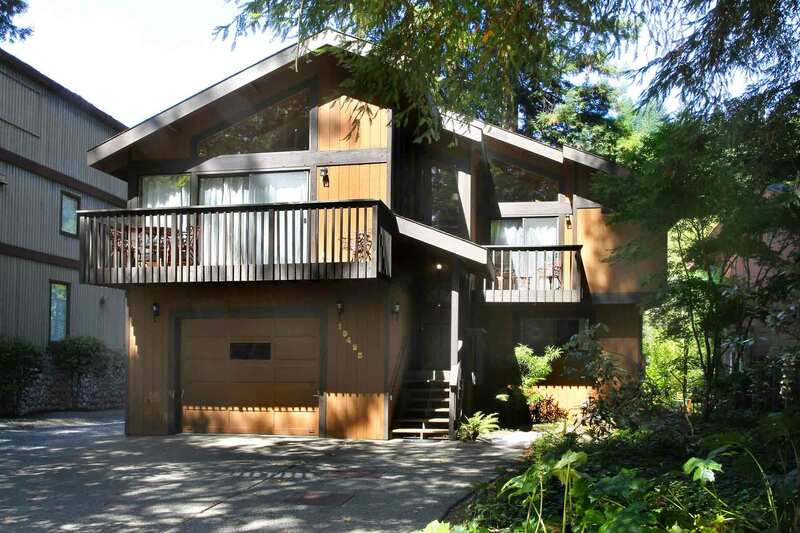 It is large, close to Guerneville and Monte Rio, and has two large seating areas so if kids are watching tv, grown-ups can be in the other sitting room. The master bed is on a slope, and the bathrooms are dark. The deck and hot-tub are awesome, but it's a shame the grass was so heavily sprinklered - it was turning into a muddy mess. As with all these houses, there are some quirky things like the light switches for example, but overall the house is nice, great for a family stay, not too run-down and not too prissy. Good for golf! We were thrilled with this house. It's very clean, comfortable, nicely decorated and in a great location. Golf is located within walking distance and there is a small beach which was perfect for peace and quiet. The only thing I would comment on is that there was no trash can for the kitchen and not enough kitchen equipment for cooking for more than 4 people, which was kind of tough since we had 8. Thank you so much for this kind review. But we do want to note that the trash can is definitely in the kitche, with extra trash bags, and there is a surplus of kitchenware of eight people. We had a great vacation at Homewood! The house was wonderful as was the access to the river. The quiet street was great for my kids to ride their bikes out front. The house had lots of room and was very comfortable. We went wine tasting, took a trip out to the ocean, played miniture golf w/ the kids, went horse back riding, went on amazing runs, played at the river. There was so much to do we could have stayed longer! 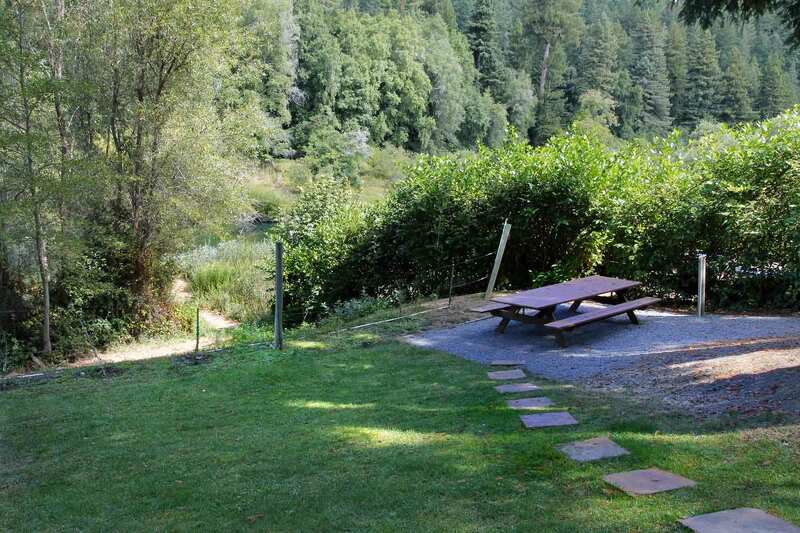 "Scenic, spacious, comfortable and accomodating"
All in all a great location with beautiful surroundings.The golf course with towering redwoods in front and river access for kiaking in the rear. 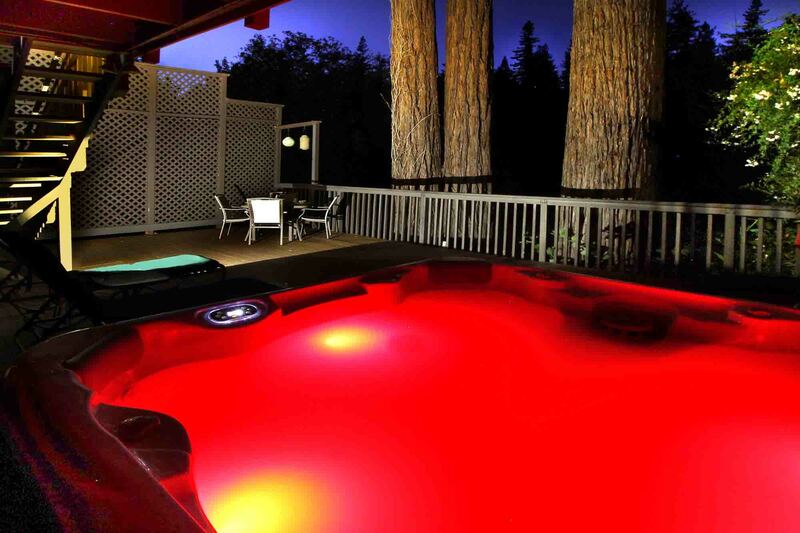 Beautiful big hot tub sunken into deck, lots of fun. If kids and elderly are accompanying you must clean the deck off so debris doesn't get into the tub. The trees made a mess of the furniture and to keep the tub clean you have some sweepin to do! Beach access is non-negotiable for elderly, sorry. The beach was puny and seasonal, which was expected, we know the area. The neighbor was a super nice older gentleman, very friendly. He had a big dog that was not "small dog friendly" but no issues with our chihuahua, we kept him under control. Kids loved it. Close to town and some great places to eat. The golf course was a fantastic place for a nice after dinner stroll but my father in law had a difficult time traversing it due to irregularities in the paths and speed bumps on the unlit road while walking back in the evening. House has lots of stairs for a guy with 2 hip replacements also. The kiaks are not real easy to get back up to the house after paddling around yet we still used them both days, lots of fun. Wished there were a way to easily haul them up the hill back to the house, maybe a winch. Represented as an 8 sleeper, but only 6 comfortably. Our kids had hard futons and ended up on the couches. Bottom room smelled musty, but after all, it is a river house. We still had a great time. "Lots of space, good location"
This place had a lot of space. 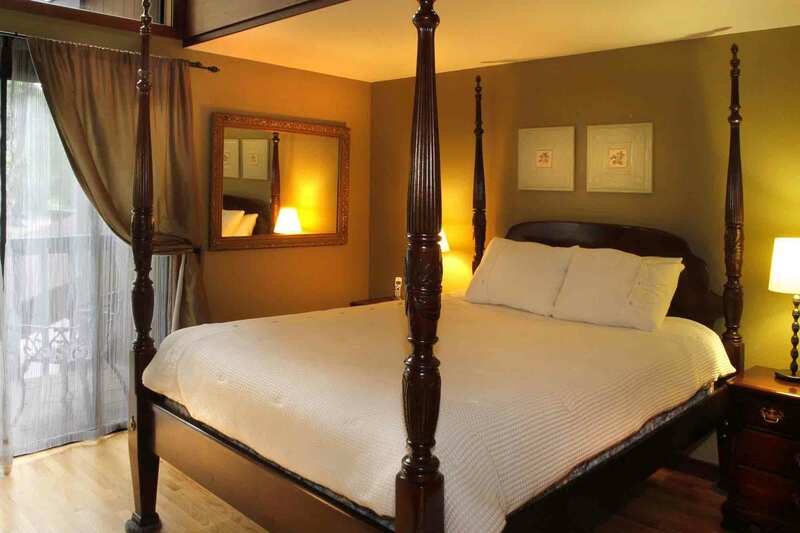 There was a huge master bedroom downstairs, and two decent sized bedrooms upstairs. There were also a few large couches. The kitchen was usable, although just a little more counter space would have been better (we did a lot of cooking). Access to the river was great.